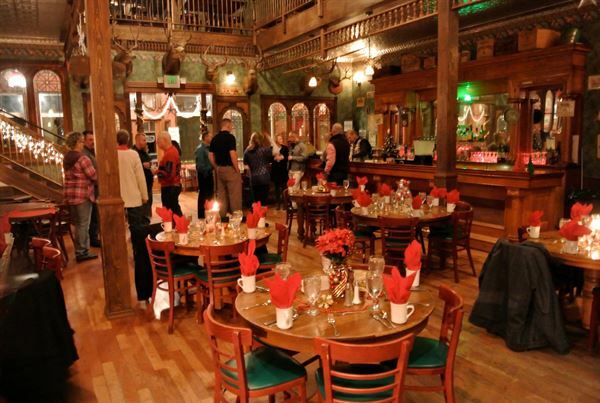 A recreated 1890's Saloon decorated with thousands of Victorian Period antiques, including a 20' Brunswick Bar, originally in Montana, manufactured in 1883. The beautiful foyer room complete with Eastlake style chairs and couches, merchandise displays and Parlor Mirror create a striking entrance. Fabulous Leaded Glass Windows from the original Grand Imperial Hotel in Seattle separate the Parlor from the main lower level of the Saloon. The lower level features dinner seating for up to 80, and show seating for 120. The raised stage is 13' deep and 18' wide, perfect for all types of entertainment venues from bands to DJs to theatre with a dressing/storage room off to one side. Lights are on dimmers and there is plenty of electrical power. Rental includes use of CD changer, microphone and stereo system. We have a list of potential local entertainment if you are interested, just let us know. Also located on the lower level is the beautiful triple arch Bar with Back mirrors.